A number historical churches are dotted around Honolulu, offering something quite different from the lengthy sweeps of sandy beachfronts. Amongst the most significant is the centrally located Kawaiahao Church, which was once both a royal chapel and the Hawaiian Kingdom's official national church, today appearing on the National Register of Historic Places. 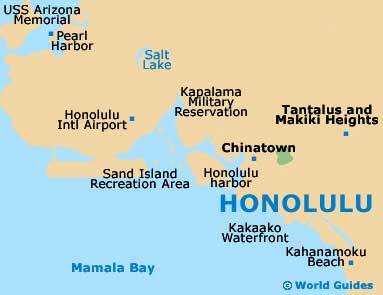 Also based in the city is the Cathedral of Our Lady of Peace, which is widely known as the Mother Church of the Diocese of Honolulu. Elsewhere, both St. Andrew's Cathedral and the Co-Cathedral of St. Theresa of the Child Jesus warrant a strong mention. The Kawaiahao Church dates back to the 1830s and is one of Honolulu's oldest, being full of history and now part of the National Register of Historic Buildings. 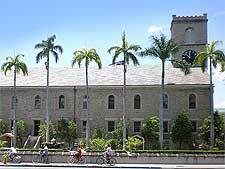 Built using coral blocks and containing many attractions, Kawaiahao Church features imposing architecture, free guided tours, an interesting portrait gallery and regular parish services, where visitors to Hawaii are welcome to attend. The Cathedral of Our Lady of Peace dates back to 1843, being constructed during the missionary era. This Roman Catholic church is actually famous for being the most historic cathedral to remain in continuous use, anywhere in the USA. Each week on Sunday, the mass (liturgy) services regularly attract more than 2,500 people. 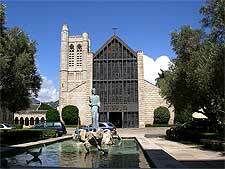 St. Andrew's Cathedral is officially known as the Cathedral Church of St. Andrew and is the home of the Episcopal Diocese of Hawaii. Built in the 1860s with traditional French Gothic-style architecture, the cathedral incorporates several prefabricated sections, which were shipped all the way over from England. Particularly striking is the stained-glass window depicting a number of important European explorers. The main entrance is graced with a long rectangular pool, complete with a religious statue and flanked by many mature olive trees. Another important Roman Catholic church is the Co-Cathedral of St. Theresa of the Child Jesus, located on the very outskirts of central Honolulu and named after St. Theresa of Lisieux. 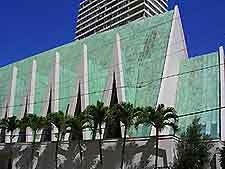 Founded in 1931, the church gained its title of 'co-cathedral' in 1984. Each year, the annual Mass of the Chrism is a major event and reliably attracts sizeable crowds. Built in the mid-19th century, the historic St. Augustine Church can be seen from a distance and contrasts with the surrounding modern architecture. The building itself is quite breathtaking and the interior is equally impressive, being highly decorated and full of intricate period features, including colorful stained-glass windows. Other attractions include an onsite museum and seasonal events. 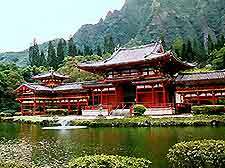 The Byodo-In Temple is a grand replica of an ancient Japanese Buddhist temple and is located in nearby Kaneohe, within easy reach of central Honolulu. A huge wooden statue of the Buddha is the main sight in this temple, a replica of the original 11th-century structure in Japan. The temple itself is located within the Valley of the Temples cemetery, which also houses a meditation house and beautiful gardens, complete with a large carp-filled pond.